Another installment of the Google+ Corpus Linguistics Community news. In addition I include links to some visual aids that were designed to answer questions people in the second round of #corpusmooc posed. Bigger is not necessarily better – Here I talk about some minor aspects of the paper, and not the more interesting aspects that is, the paper compiled a list of approximately 14000 pairs of collocations that are worth teaching. The list is not available as of yet. The other main finding is that frequency is more important than dispersion or chronological data when identifying collocations, with human judgement remaining a key factor in deciding on useful collocations. Google as a corpus with students – Some interesting recent developments on using Google as a corpus with a short list of relevant online reading. How to develop effective concordance materials using online corpus – My interpretation of a slideshow by a Korean researcher on using data driven learning materials. Do check out the other corpus lingustics community news if you haven’t already. 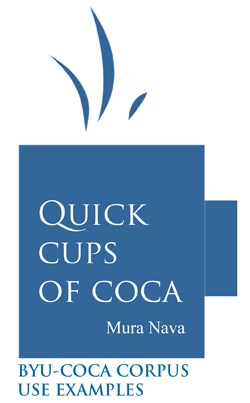 Mura Nava consistently posts great things on corpus linguistics and corpus-based pedagogy. If you’re interested in corpus linguistics for the classroom, her blog at EFLNOTES anther twitter feed @muranava are a great place to find resources. I’m reflagging her recent post here, but please do visit and follow her blog at eflnotes.wordpress.com.